Acanthodactylus dumerilii. Merzouga. Photo: © Mario Schweiger. Mario Schweiger (2012): Acanthodactylus dumerilii (Milne-Edwards, 1829). Au: Martínez, G., León, R., Jiménez-Robles, O., González De la Vega, J. P., Gabari, V., Rebollo, B., Sánchez-Tójar, A., Fernández-Cardenete, J. R., Gállego, J. (Eds.). Moroccoherps. Amphibiens et reptiles du Maroc et au Sahara occidental. Disponible à www.moroccoherps.com/fr/ficha/Acanthodactylus_dumerilii/. Version 12/10/2012. Consulté le 25 Apr 2019. 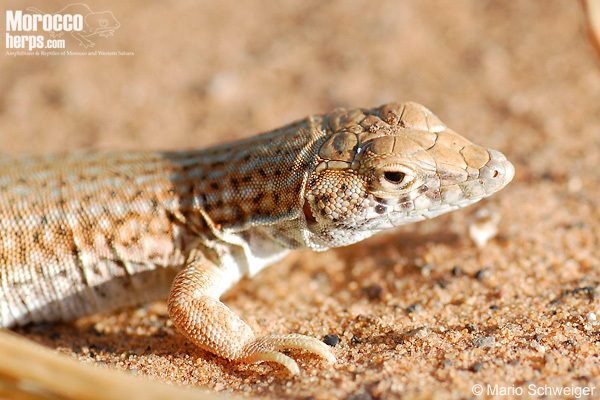 English: Dumeril's Fringe-toed Lizard, Small Fringe-toed Lizard. Aire de répartition de Acanthodactylus dumerilii. On the correct scientific name of Acanthodactylus dumerilii. In 1829 Milne Edwards described Lacerta dumerilii. Following authors used dumerilii in the same way, as written by Milne-Edwards (with double “ii” at the end), although sometimes in different genera, like Gray (1838) = Meroles dumerilii, Boulenger (1887) = Acanthodactylus scutellatus var. dumerilii, Boulenger (1918) = Acanthodactylus scurellatus var. dumerilii. In his Monograph of the Lacertidae, Boulenger (1921) suddenly wrote Acanthodactylus scutellatus var. dumerili, with one “I” at the end. From this moment, most authors wrote dumerili, and also cited Lacerta dumerili MILNE-EDWARDS, 1829 wrong (just with one “I” at the end), like – beside others - Salvador (1982) and Crochet et al. (2003). The correct name of Acanthodactylus dumerilii has to be written with two “i”. Together with, distributed in Morocco, Acanthodactylus aureus and A. longipes, A. dumerilii belongs to the Acanthodactylus scutellatus species group. 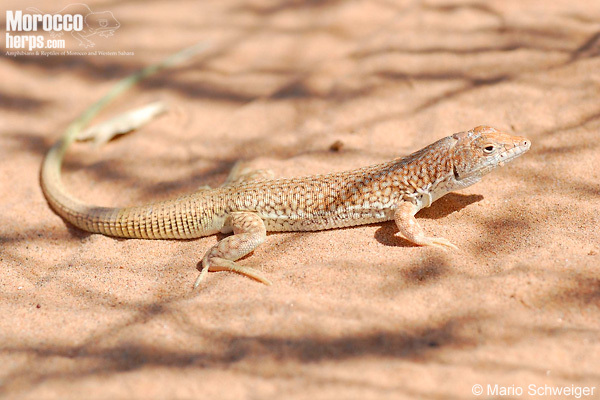 While there is no distribution overlap with A. aureus, Acanthodactylus dumerilii may be found together with A. longipes in the Erg Chebbi and the Mhamid area in southern Morocco, although their habitat preferences differ a bit. Female. Merzouga. Photo: © Mario Schweiger. For the morphological differences between the last two mentioned species, please see table at the A. longipes account, or check Crochet, Geniez & Ineich (2003). For us, the most easy to see differences in the field is the coloration of both species. Acanthodactylus longipes has a more or less uniform coloration without dark spots on the body. In Acanthodactylus dumerilii there are always distinct dark brown or even black spots all over the dorsal side of the body, giving the species a more or less spectacled appearance. Adult male. Oued Ziz. Photo: © Mario Schweiger. Although A. dumerilii could be seen together with Acanthodactylus longipes within a few square meters, both species don’t really share the same habitat. While A. longipes prefers clearly the open, wind blown dunes, A. dumerilii lives more at the edge of the dunes with some vegetation (bushes, Halfa-grass Stipa tenacissima). It digs its holes close to vegetation between the roots (own observations). Acanthodactylus dumerilii is distributed from the northern half of Tunisia in the east across Algeria und Morocco, Western Sahara to Mauritania in the southwest. 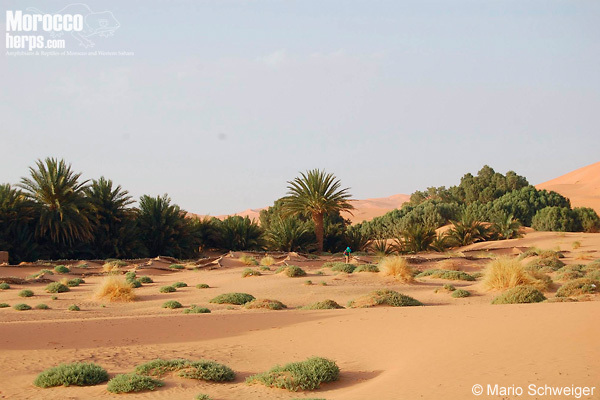 In Morocco the species lives south of the Saharian or Anti-Atlas mountain chain from Figuig in the east, in and around the Erg Chebbi and the Mhamid/Zagora area. There are to lonsesome records from southwestern Morocco (near Aouinet Torkos and close to the Algerian border near Tindouf) (Bons & Geniez, 1996). 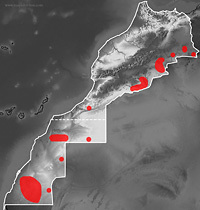 In the Western Sahara it is widely distributed, but didn’t reach the coastal area. There it is replaced by Acanthodactylus aureus (Geniez et al., 2004). In Mauritania, in contrast, it is only known from the coastal areas (Crochet, Geniez & Ineich, 2003). 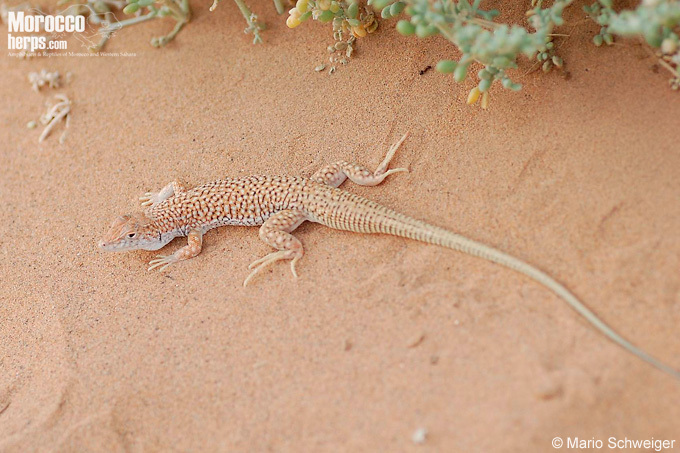 We observed Acanthodactylus dumerilii at the edge of Erg Chebbi, on smaller dunes west of Erg Chebbi, separated from the large dunes by some kilometres of black Reg desert, along the dry Oued Ziz north of Erg Chebbi and on more hard substrate along the road N12 near Missici (approx. 50 kms west of Rissani). All observations have been made, where there was a more or less dense Halfa-grass or other plants growing. We never have seen the species out in the open dunes, far away from vegetation. Everywhere, the population density was high. For example, at the dry Oued Ziz, every 5 to 7 meters a specimen have been spotted. Boulenger, G.A. 1887. Catalogue of the lizards in the British museum (Natural History). Second edition. Volume III. Lacertidae, Gerrhosauridae,Scincidae, Anelytropidae, Dibamidae, Chamaeleontidae. London. 682 pp. Boulenger, G.A. 1921. Monograph of the Lacertidae. Vol. II. London, 474 pp. Milne-Edwards, M.H. 1829. Recherches zoologiques pour servir à l´histoire des Lézards, extraites d'une Monographie de ce genre. Annales des Sciences Naturelles, Paris 16: 50 - 89 + 4 plates. Salvador, A. 1982. A revision of the lizards of the Genus Acanthodactylus (Sauria. Lacertidae). Bonner zoologische Monographien. Nr. 16; 166 pp.